Well, good news, we didn't get that much snow yesterday. It was sloppy during the day, some snow, some rain, freezing drizzle. Mum had to go out for an appointment, meet with her money man. Then he took her to lunch since they both have a purrthday in February. The woofie from the other day, well, before mum left he was sniffing up her pant let and then licking her leg. Getting rather purrsonal with her! Back off Elliot, she's my mum! 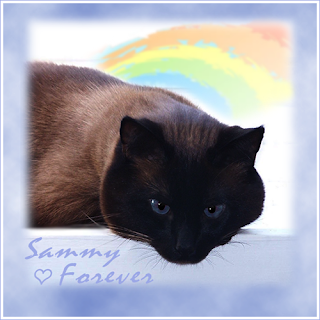 We lost another original blogger cat in Sammy Meezer. Another old furiend of Derby's, they used to party together all the time. I am sure these old furiends are having quite the party at The Bridge. I know mum would miss me if I went to be an island cat. Maybe an honorary Island Cat? In our throw back this week, Derby talks about being called Derby. Do you have a story about your name? Now we all have our names, some of us have had more than one name. I was originally named Benny, or at least that was my name at the shelter. Mum renamed me Derby, since I was adopted on Derby Day. When I was at the vet the other day the tech who was helping said she used to have a kittie named Derby! Plus he had a sisfur name Daisy! Skeezix has an interesting name. Did you know there was a cartoon character of the same name? Yup, there was and it was in the cartoon, Gasoline Alley. Do you have an interesting story about your name? Mum says we will have a regular weekend this weekend. Just the normal stuff, she has to get her head fur trimmed. A little shopping for foods, plus the cleaning stuff and laundry. Otherwise we can snuggle, watch birdies and such. Maybe even a nap or two! Happy Weekend everyone. I'm named after William B. Travis - da commander of da Alamo. Momma are a San Antonio native. And Crockett are named for Davy Crockett, so we has a theme going. I wish I had a good story about my name, but it came from my breeder, who names kittens after songs. The song I'm named after is Summer Samba. Next time your mum is going over to Elliot's house, you need to rub your scent all over her legs and make sure she's properly furred up between the knees and the ankles. That might signal to Elliot that she's 'taken' and he needs to keep his distance. WE love seeing flashback posts. Lots of sadness in the blogosphere this week We were friends with both Wally and Sammy and enjoyed so many fun times with them. Ducky, just by chance, I'll be having lunch with the lady with the yellow hair from The Island Cats today! I'll put in a good word for you, okay? Really? Give her hugs from mum, lots of headbonks from me. Not as much snow is a darn good thing. Yes, there's been too much sad and we sure hate that about Sammy too. I am glad you didn't get as much snow as expected. I am very sad about all our old friends heading off to the Bridge. We remember about Derby's name origin. And Grampa used ta call Skeeter "Skeezix" because of Gasoline Alley. Skeeter's name came from a Southern term for mosquitos, because as a kitten he buzzed around TBT like one. LC was short for Little Cow because of her black/white splotches. Marley is named after laid-back Bob Marley. Iza and Ayla are named after 2 characters in Clan Of The Cave Bear books. 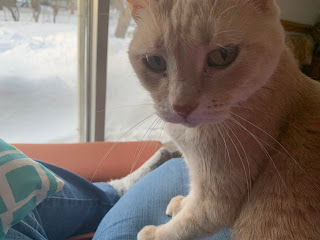 Of cats who came before the blog, Mischief was named because she got into a lot of it and Tinkerbelle came with a reverse name because she was nothing like the Peter Pan pixie (TBT hesitates to rename adult cats in case it confuses them). That was the purrfect name for Derby! At the shelter my name was Gypsey but mom named me after Laila Ali, who was her favorite dancer on Dancing With the Stars that season.